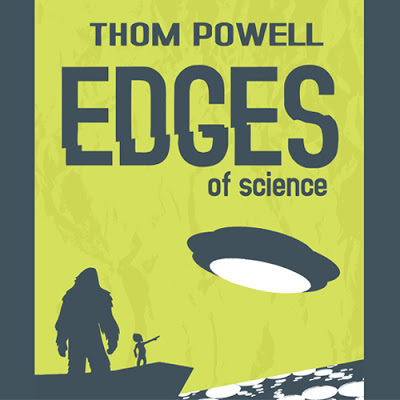 Shady Neighbors, the just-released novel by Thom Powell, involves a rural-living family that unintentionally begins to interact with one or more of the local sasquatches. 'Shady neighbors' is a double entendre (a phrase that is meant to be understood in either of two ways) in that the main character has a conflict with a duplicitous neighbor and a sasquatch. Though the story is fictional, research indicates that interaction with these mysterious beings is indeed possible. That isn't such a new idea. I covered the idea pretty thoroughly in The Locals back in 2003. The Albert Ostman story of being abducted by sasquatches goes back to 1924. As a consequence, I am sometimes asked whether it is possible to initiate some kind of interaction with a sasquatch. Answer: I think so. So how might one go about doing that? First, I would caution an interested soul to be careful what you wish for. You just might get it and you may regret it. The creatures in question have very different individual personalities, just as people do, and some of them may not be all that nice. Once you let them know who you are and where you live, you can't undo that. There are places in Oregon where field researchers have experienced such menacing events that some of us feel it is prudent to stay out of those places. The upper reaches of the Abiqua drainage of west-central Oregon is one such place. I have not endured anything overly menacing in the Clackamas drainage nearer to my own home, so I have made cautious attempts to interact with the phenomenon in this area for a number of years now. Before I proceed, the usual caveats are in order: I don't know anything, I only have strong suspicions based on vague experiences. Also, there is no such thing as a truly scientific approach to such questions since alleged sasquatch encounters cannot be replicated at will. So, all I have is a fistful of patterns and tentative conclusions based on unverifiable personal observations. 'Nuff said on that. The first thing I think I know is what not to do. You've got to meet these being on their terms and cameras are a big no-no. Microphones and audio tape do not seem to be a 'deal-breaker' but in general, attempts to scientifically document the phenomenon are counterproductive if your goal it to get close to them. Wearing a side arm may also be allowable provided one's intentions are not to use it on these creatures. Personally, I don't carry a gun because I don't want the extra weight and I haven't yet encountered a situation where I felt I needed one. I don't even carry a flashlight most of the time, since I know my area very well and turning it on ruins my night-sight for ten to twenty minutes after I turn it off. I travel alone, after dark, of course, but I often will bring the dog since he hates being left behind. 'Wilson' is a docile and friendly golden retriever who seldom barks. He a good indicator of creature presence. When he becomes fearful and takes off for home without me, something is 'out there.' An aggressive or high-strung dog that barks a lot is definitely a bad idea. My approach has changed over the years. For a long time, I was looking for evidence and setting out cameras. I've decided to try a different approach, at least for a while. I am certainly not opposed to those who are still trying to gather good evidence. I am completely supportive of their efforts and I will share with them any information I've gathered (as long as they're not trying to shoot something.) But I'm not pursuing that goal, myself. I'm not even trying to see one. I am pretty sure I already saw one briefly, but I'm not trying to see one for the same reason I've stopped trying to photograph one: I feel it is counter-productive. My approach now centers on the idea that you have to meet them on their terms. Let them find you. They're not always there, but even when they are, they are very shy about being seen. I know what your thinking: "If you don't want a to collect photographic evidence and you don't even want to see one, what's the point? You're just going to be seen as a delusional idiot who's chasing ghosts." No problem. I don't need ridicule in my life so I don't talk about what I'm up to with very many people. I know they wouldn't understand, and it would take too much time to explain it to them, anyway. But what I am trying to do is use the phenomenon for another purpose, and that purpose is to sharpen my own perceptions and mental processes. Allow me to explain. I have noticed that, whenever I am struggling with a difficult problem, a walk in the woods at night always helps, and in most cases, it makes an amazing difference. I have had more good ideas while woods-walking than I can even count. I'm a writer. The thing writers need more than anything else is inspiration. Whenever I need inspiration, I go for a walk in the woods. Usually it's after dark, when the dishes are washed, the homework is done, and the kids are in bed. The daytime woods works well, but the nighttime woods seems to work far better. I try to think loudly when I'm walking. I think the same thought over and over. I mull over a question,.I ponder a literary problem. An answer always comes before I get back home. I don't know that the sasquatch has anything to do with this. Maybe they don't. I'm good with that, too. There is plenty of research to suggest that taking any walk is healthful and inspirational even if it is a walk around city blocks or neighborhood streets. Still, I think I have noticed a subtle but distinct difference when I take a long walk in a dark woods. I also sleep out in the woods in the summer. Maybe I am crazy, but the clarity of my thoughts and the richness of the ideas I am able to articulate in writing seems to increase immediate afterward. I don't know where the inspiration comes from, whether it comes from simple relaxation of my own mind, or from somewhere or something outside it. I guess I don't care. If it's useful I just want to use it. This idea has been around for a long, long time. These days it is often described as getting in touch with your 'inner muse;' that is, the creative force we all have within even though most of us don't know how to access it. Ancient Greeks felt that there was a creative force in Nature that came from somewhere outside our being. It was the god, Pan. 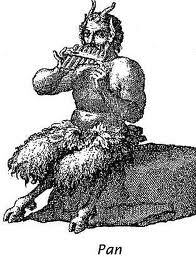 The fields, groves, and wooded glens were the domain of Pan, who could offer inspiration, especially in music and art, to those who sought it there. The Romans agreed, although their equivalent of Pan was called Faunus. Check out the artistic representation of Pan at right. It's basically a primate with hooves for feet. (It had a bent-kneed gait that should be familiar to sasquatch researchers.) A millennium later, the Romantic Movement of 19th century English and American literature asserted that artistic inspiration came from exposure to "the sublimity of wild nature." 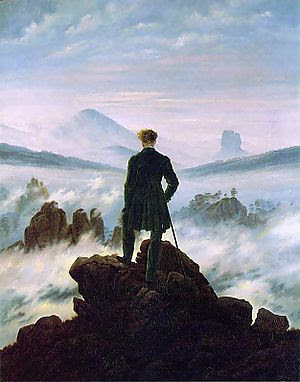 They didn't suggest any particular entity or being at the core of this phenomenon, you just got inspiration from being there, as portrayed in the Romantic artwork at the top of this post. What ever it is, it works for me if I let it. I always take a long walk before I do one of these essays. Almost all of the twenty-seven chapters of Shady Neighbors were formulated and honed during midnight walks. How good the book is remains to be seen, but I was constantly amazed by the complexity of the ideas that popped into my head when I thought as I walked at night. I started carrying a small notebook so I didn't lose the ideas that sometimes broke over me like a wave. I started carrying a small flashlight that I held in my mouth as I jotted down notes. Later, I bought a small headlamp. I'm better at remembering the ideas than I used to be, so I don't worry about writing them down as much anymore. I was doing an interview the other night on Steve Kulls' Sasquatch Detective and I commented that I'm not looking for sasquatch evidence any more. I just let the phenomenon wash over me. I'm sure I sounded all 'new age' and spacey, but maybe this essay helps to clarify the point. Quite often I am surrounded by some sort of creature calls. Usually, it is coyotes or owls, but other times I have no idea what it is. A pack of coyotes can make some pretty intimidating noises, especially when the noises are coming from the direction I must go in order to get back home. I don't turn on the flashlight or try to scare it away. I just keep walking, slowly and quietly. Sometimes, the noises follow me home. When it seems close, I talk to it. I don't go out there and ask for things. I try to exude appreciation and gratitude for the inspiration I think I'm getting. Pretty 'new age' stuff, eh? What I'm doing, in fact, becomes indistinguishable from the prayer that I was taught to do in the Catholic churches of my youth. I'm just doing it in the woods, instead of church, and I'm walking instead of kneeling. I've heard people say that 'the woods is their church' and I guess I'm starting to feel the same way myself. One particular experience is worth describing. On one summer morning last year I woke up before dawn and couldn't get back to sleep. I got dressed, grabbed a blanket and a folding chair, and headed for the forest. When I got to my favorite spot beneath the drooping branches of a big cedar tree, I whacked a tree a couple times with my trusty Louisville Slugger, bundled up against the predawn chill and sat down. Suddenly, my entire body suddenly felt like it was glowing. I couldn't move. Next thing I knew, I awoke and it was broad daylight, two hours later. I'm not sure, but I think something happened. Chris Noel and some other researchers I've read call it "getting zapped." I think I got zapped. Strangely, for the next few days, I experienced a mentally clarity that I never knew before. When I looked at people's eyes I knew what they were thinking. I knew what they were going to say before they said it. It really freaked me out. I was in the midst of writing the novel and I went on a tear. I must have written ten thousand words in three days. Eventually, the feeling faded away and I was back to being my old, slightly clueless self. You might say I got a temporary 'software update' on my own mental computer. You know, like your computer gets when Microsoft sends out the patches and updates that are automatically downloaded to make your computer run better. It may not ever be provable, but that's what if felt like and it's an analogy we can all understand. As previously stated, I really don't know that any of this inspiration stuff is related to the sasquatch phenomenon. Everything I'm describing is based on a hunches, feelings, and instincts. I am gradually learning how to better trust my instincts. A few days ago, I was having a burger and a beer with my friend Roger Hediger. Roger is a retired cop. He was telling me that, as a former trainer of rookie policemen, he tried to teach them that instincts are an important part of police work. He related an example in which he once entered a house in pursuit of a suspect and the occupants all fled upstairs. But his instincts told him to go downstairs so that he did, and indeed he found the gangster hiding in a basement closet. In other dangerous situations, Roger listened to the 'vibe' when there was one, and he felt that his instincts kept him alive in a few other tense situations. Roger also said that, when the situation was tense and he didn't listen to the vibe, someone always got hurt. I'm a science teacher. I also know that that science doesn't have all the answers. I don't know whether the sasquatch has any connection to the vibes, the ideas, and the inspiration I get when I walk in the woods. I do know that my interest in the sasquatch led me to this vague but useful phenomenon. Like my friend Roger, I guess I don't always care where the vibe comes from. I've just learned to listen to it and use it. I get fantastic vibes when I put myself in the middle of a dark forest. When I have a question or a problem, I take it to the woods and I always get an answer. I like that. Being in touch with yourself in their element is the first step to being able to 'feel' their presence there too, and being able to 'feel' when they are near is when things really start getting interesting. Re the night vision Thom, visit an outdoor store and pick up a headlamp with a red lens that has adjustable intensities. The red light will preserve your night vision.